The Northeast Spa & Pool Association (NESPA) has recently named its winners for the 2009 Service Company of Excellence Awards. Local company, KAZDIN POOLS AND SPA of SOUTHAMPTON has been awarded the BRONZE for their exemplary customer service and customer relations. Each company was judged by 16 of their customers who were asked to rate the customer service they received. The scale was from one to ten – one being very poor and ten meant going above and beyond the call of duty. The companies were judged on six categories of service, which included response time, performance in service and repairs, employee appearance and attitude, level of recommendation and overall performance. The purpose of the awards is to recognize and reward NESPA members whose servicing and repairs of pools are partnered with excellence in customer service. The recognized companies meet the problems of installed pools head-on while maintaining a positive, accommodating and informative attitude with their customers. 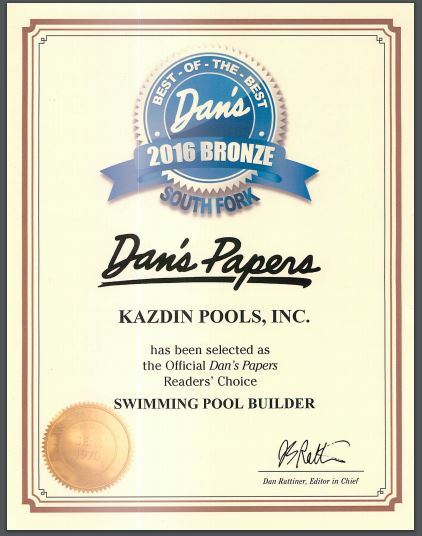 KAZDIN POOLS & SPA was also the recipients of Dan’s Papers the BEST OF THE BEST award. The award is a result of a contest in which consumers in the area vote for the best business. This marks the fifth consecutive year that Kazdin Pools & Spa has received this award. Kazdin Pool and Spa has received two industry awards. Competitions were held by both the North East Pool & Spa Association (NESPA), and the Long Island Pool & Spa Association (LIPSA). LIPSA held its first annual Pool and Spa awards competition in December 2007 at the Atlantis Marine Aquarium in Riverhead, N.Y. Kazdin received a Gold Award for a gunite pool renovation in East Marion. NESPA recognized Kazdin as one of the best Pool & Spa service companies in the Northeast presenting Kazdin Pool with a Bronze award as “A Service Company of Excellence”. The competition was held by NESPA in September in Florham Park, N.J. Glenn Cook Vice Pres. Noted that “these wards are due to the excellent staff we have both in the field building and servicing pools and spas and our administrative staff inside. George Kazdin Pres. said “we have been recognized both locally and nationally with over 75 awards in the past 35 plus years”. Kazdin Pool & Spa was established in 1972 their showroom and offices are located at 833 County Rd. 39, Southampton N.Y.
Kazdin Pools won an award of merit from the Northeast Spa and Pool Association in a competition held in September 2006. Entries were received from the states of New York, Connecticut, New Jersey & Pennsylvania. The winning freeform pool was built for Deirdre Kiddre in Sag Harbor. In addition to the shape the pool features a custom waterfall and custom irregular bluestone patio. George P. Kazdin, President, says,” this makes over 70 design awards that our firm has won”. Glenn Cook, Vice President, adds “we are starting our 35th year of servicing the eastern Long Island community and we are proud of our service and construction capabilities”. Kazdin Pools is proud to announce our recognition as a RETAILER OF EXCELLENCE. The award was given at the National Spa & Pool Institute’s annual convention held in fall in New Orleans. Award winner’s were required to demonstrate proper retail expertise as well as providing proof of on going technical and business proficiency. This is the second RETAILER OF EXCELLENCE AWARD we have received. Kazdin Pools Inc. is located at 833 county rd.. 39 in Southampton. George Kazdin’s client dearly loves her two Rottweilers and one English Mastiff – all of which she rescued. She has a vanity plate on her car stating that she’s a dog lover, and that she does volunteer work for a local Rottweiler rescue organization. So when she decided to build a pool, she naturally figured her dogs would like to swim, too. But love does have its limits. “She didn’t want to have her dogs dirtying up the big pool,” says Kazdin, president of Kazdin Pools & Spas in Southampton, NY. The answer? Give them their own 13-by-2 foot pool right next to the main 20-by-40 foot people pool. “ Whereas everyone else would build a kiddie pool for their grandchildren, she built a kiddie pool for her Rottweilers,” Kazdin says. “That was pretty much a first,” adds Glenn Cook, company vice president. Cook, who worked with the client, says she came to him knowing what she wanted. “She knew a vinyl pool wouldn’t work out because these dogs are about 125 pounds a piece,” he says. So the builder began with a gunite pool structure. Cook placed one step in the 2-1/2-foot deep vessel so the canines could have east access. The pool was designed with its own circulation system. “We didn’t want to mix any of the water between the two pools,” Kazdin says. An oversized cartridge filter removes the extra hair from the system. The builder also chose this medium because of the pool’s size. “You couldn’t backwash a pool like that. You’d lose too much water.” Kazdin explains. A commercial-sized chlorinator addresses the extra bacteria that dogs carry in their coats. “We made the client aware that the skimmer baskets and pump baskets have to be cleaned a little more often,” Kazdin says. “The filter might have to be cleaned twice a year as opposed to the once a year it’s designed for. And we just have a very good flow rate in there.”The doggie pool, as it came to be called, also has dual main drains with anti-vortex covers. As a finishing touch, the client requested a plaster casting of one of the dogs’ paws set in the shell. Crews poured some plaster in a bucket and took the canine’s print to create something of a decorative tile. Crews set it on the pool and plastered around it. But the whole place still went to the dogs. “The idea that dogs would have their own area to go into hasn’t proved to work out so far.” Cook says. The Board of Directors wishes to thank you for your efforts as our Number One Fund-Raiser for 2002. To you, your staff and your customers who contributed to help Marty’s Kids, we thank you. 30 years ago, after learning the basics about the pool business and graduating from Southampton College, George Kazdin founded Kazdin Pools and Spas, Inc. It started as a pool business service company: Opening pools, closing them, vacuuming, testing water, adding chemicals, and doing minor repairs. It was a $72 investment, and Kazdin’s office was in the back of his car. George and Pat married, and the growing company was moved from George’s car into their home. Their family also grew. With the additions of their daughters Amy and Julie, the Kazdin home started getting a little crowded. By 1980, Kazdin Pools and Spas moved to its present location on North Highway in Southampton. Today, the Southampton complex houses the corporate headquarters, warehouse and retail store. 24 years ago, Glenn Cook joined the firm. He’s George’s right hand man, heading up Kazdin’s service department and dealing with the company’s daily operations! In 1984 the company won the first of 70 local, regional and national awards. Among them: Retailer Excellence. Kazdin Pools and Spas consistently wins the prestigious Aqua 100 award as one of the top 100 companies in the industry. Kazdin Pools and Spas are also certified by the National Spa and Pool Institute (NSPI) in both building and service. From the start, George understood that without the community, there was no Kazdin Pools and Spas. “If you’re going to work and live in a community, you have to help support it.” That’s how George Kazdin’s motto of “you have to give back” was born. It’s almost mandatory for Kazdin’s staff to be involved in the community. Among the staff are: Masons, Girl Scout Leaders, members of the Riverhead and Hampton Bays School districts, and members of the Order of the Eastern Star and Air National Guard. George Kazdin serves as a member of the Board of Directors of the Northeast Spa and Pool Association (NESPA), and Southampton Hospital. He’s the Co-President of the Long Island Chapter of the Pool and Spa Association, and serves on the Retail Council of the National Spa and Pool Institute (NSPI). He also prides himself as being a conservationist. As a member and President of the Shinnecock Marlin and Tuna Club, George led the way by tagging and releasing the most Albacore Tuna of any Captain in the world. This 30th Anniversary year, George Kazdin and staff maintain his philosophy of giving back to the community. As part of their Kazdin 30th Anniversary, Kazdin Pools and Spas will donate $1.00 from selected Bio-Guard Chemicals for every unit sold at their retail location to the Marty Lyons Foundation. The Foundation grants wishes of critically ill children and their families. Its uniqueness is that almost all of the administrative support is donated by corporations. participating Corporations; therefore money is not lost for huge overhead. All the money we raise will stay on Long Island to help local families. Kazdin Pools & Spas will be contributing $1.00 from every unit of Bio Guard chemicals purchased in our store from Memorial Day to mid August. We appreciate your patronage and support. Additional monetary donations will be gladly accepted. Checks can be made out to LIPSA MARTY LYON’S. March 20, 2002, Southampton, NY ” For the fifth consecutive year, Kazdin Pools and Spas, Inc. is proud to have received one of the highest honors a pool company can receive. The nationally prestigious Aqua 100 award. During the past eleven years, Kazdin has been honored by receiving this nationally recognized award seven times. Entrants were judged by a distinguished panel of industry professionals, and were critiqued in five critical areas; customer service, product knowledge,store design, quality/craftsmanship and advertising/promotion. “Receiving this award while we’re celebrating our 30th Anniversary, is especially rewarding” according to George Kazdin. Kazdin Pools and Spas has been building,designing, renovating and servicing award winning pools and spas on the East End of Long Island for 30 years. Kazdin Pools & Spas, Inc.
Southampton, NY – Southampton Hospital has announced the appointment of Maurice D. Goldman, D.M.D. and George P. Kazdin to the Board of Directors. Dr. Goldman and Mr. Kazdin, both Hampton Bays residents, were welcomed as Directors by the Board at its meeting on June 16, 2001. Dr. Goldman was born in Greenport and raised in Riverhead. After completing his professional education, he served in the United States Air Force. During his tour of duty, he was based in Tokyo, Japan. He worked in the second largest staging hospital for Vietnam and ran the Sick Call for the clinic and treated specialized patients. After his years in the Air Force, Dr. Goldman returned to Riverhead and entered into his father’s general dental practice. The practice had offices in Riverhead and Southampton. He focused on cosmetic and reconstructive procedures while still maintaining a family practice. In recent years following retirement, Dr. Goldman has become very active in community activities. He has served as Fund Raising and Business Chair for the Hampton Bays Beautification Association, Editor of The Hamlet News, Webmaster of www.hbba.net, the Beautification Association’s website, concert organizer for Concert-Under-the-Stars, communications advisor, frequent speaker at the Southampton Town Board meetings representing the Hampton Bays community and local issues. Dr. Goldman’s interests include volunteerism, gardening, fishing, boating, travel and computers. George P. Kazdin is a local businessman who started his pool business in 1972. Beginning with a used car and $70, Mr. Kazdin has built Kazdin Pools and Spas into a successful business on North Highway in Southampton. His firm has received 68 design awards from the National Spa and Pool Institute. Kazdin Pools and Spas has been chosen for the fourth time by Aqua Magazine as one of the top 100 pool companies in the United States. Kazdin has just been recognized by NSPI as one of the first 11 Retailers of Excellence in the country. Mr. Kazdin has served at every level of governance with in the National Spa and Pool Institute. He has chaired many councils and committees as well as holding most offices. He has also held offices in both the Long Island Chapter of NSPI and at the regional level in the Northeast Spa and Pool Association. He holds every accreditation offered by the industry and is a Certified Service and Certified Pool Building Professional. Mr. Kazdin is a featured speaker and instructor at industry conventions and events. He has also written and contributed to many articles published in trade press. Currently, he is on the board of directors of Swimming Pool and Spa Age and serves on the Retail Council of the National Spa and Pool Institute. He is locally active in school and community affairs. He is a sports fishing enthusiast and conservationist. He is a USCG Licensed Ships Master regularly acting as Captain on his Charter Boat, the Patsy K. II. Southampton, NY – For the fourth consecutive year, Kazdin Pools and Spas, inc. is proud to have received one of the highest honors a pool company can receive. The nationally prestigious Aqua 100 award. Entrants were judged by a distinguished panel of industry professionals, and were critiqued in five critical areas; customer service, product knowledge, store design, quality/craftsmanship and advertising/promotion. In the past ten years, Kazdin Pools and Spas has been honored by receiving this award six consecutive times. For 29 years, Kazdin has been building, designing, renovating and servicing award winning pools and spas on the East End of Long Island. Southampton NY – In a joint effort to give back to the community, Kazdin Pools and Spas along with Marquis Spas is proud to donate $4,500.00 to The Breast Health Center at Southampton Hospital. In August, Marquis Spas auctioned one of their premier units and authorized Kazdin Pools and Spas, to donate the proceed to the charity of their choice. “We chose The Breast Health Center at Southampton Hospital because of the importance of the cause, and the great work they’ve been doing for women in the community” said George Kazdin. George Kazdin, President Kazdin Pools & Spas, Inc. presented a $4,500.00 check to Mr. W. Peter Daniels, President/CEO of Southampton Hospital (left), on Wednesday September 13th. Also in attendance was Ann Marie Brierley, RN of The Breast Health Center(center). For More Information Contact: George Kazdin Kazdin Pools and Spas, Inc. 835 North Highway Southampton, NY 11963 631-283-4884. Kazdin Pools and Spas – Did What Again? Southampton, NY — Kazdin Pools and Spas, Inc. — For the third consecutive year, and the fifth time in the past ten years, Kazdin Pools and Spas, Inc. is, once again, proud to have received the nationally prestigious Aqua 100 Award. This award is one of the highest honors a pool company can receive. Judged by a distinguished panel of industry judges, pool companies from twenty-nine states were critiqued in five critical areas: Customer Service, Product Knowledge, Store Design, Quality/Craftsmanship and Advertising/Promotion. The Aqua 100 award is added to the growing list of 68 awards for their superb design quality and service. For over 30 years Kazdin Pools and Spas has been building, designing, renovating and servicing award winning pools and spas on the East End of Long Island. For More Information Contact: George Kazdin Kazdin Pools & Spas, Inc. 835 North Highway Southampton, NY 11963 (631)283-4884. Southampton, NY — Kazdin Pools and Spas, Inc. is proud to announce that they have received another design award. A Kazdin pool built in Montauk, NY was recognized for it’s superior design, with a silver award from The Northeast Spa and Pool Association. This design award joins Kazdin’s 66 other local, regional, national and international awards. For almost 30 years, Kazdin Pools and Spas has been building, designing, renovating and servicing award winning pools and spas on the East End of Long Island. Kazdin Pools and Spas – Does it Again! Southampton, NY — Kazdin Pools and Spas, Inc. is proud to announce that they have added two more awards to their wall of fame. A pool that Kazdin built in Southampton, NY was recognized for it’s superior design, with a bronze award from The Northeast Spa and Pool Association. Additionally, the same pool received an international bronze award from The National Spa and Pool Institute. These design awards are added to Kazdin’s 64 other local, regional, national and international awards. For almost 30 years, Kazdin Pools and Spas has been building, designing, renovating and servicing award winning pools and spas on the East End of Long Island. For further information, drop us a line.